Women are far less likely than men to negotiate their salaries. This can cost them thousands in earnings over the course of their careers, according to multiple studies. This lack of negotiating power only hurts women and helps to continue the gender pay gap. Erroneously, many women also assume that negotiating ends after you land the job. But truthfully, that is only the beginning. You will need to continue to negotiate your pay increase every year, and even negotiate for other non-monetary items, like resources, flex time, and more. No matter what stage of your career, it’s important to arm yourself with successful negotiating tactics. 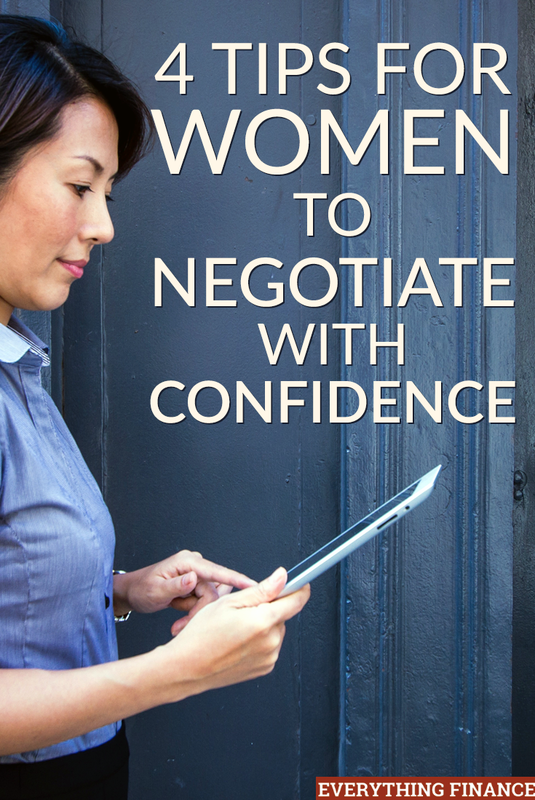 Here are four ways women can become better negotiators. Many women are simply too timid to come across as negotiating powerhouses. But what’s even more scary than negotiating? Losing out on thousands of dollars simply because you didn’t want to step out of your comfort zone. Women aren’t raised to be aggressive or demanding—and when we are, we are chastised for it. But this is a stigma that needs to be dispelled, especially when it comes to negotiating. So lose your fear of talking dollars by arming yourself with information and doing research. Read on. Never go into negotiations without having knowledge. Knowledge is power, and you need to have all the power. Many times women mistakenly believe that a company will rescind an offer if you negotiate your salary. But by the time you reach the negotiating table, a company has spent hours and lots of money to get to the point of actually selecting you as the candidate. Men negotiate all the time and are never fearful of losing the opportunity—women shouldn’t be either! To feel prepared, arm yourself with salary data. Research comparable salaries in your field, research the pay at your company through sites like glass door.com and salary.com. Also consider your experience and education and what sets you apart from other candidates. Make sure they know exactly how much you’re worth. Too often we jump at the first offer thrown our way because we feel like that’s all they may be able to afford. But that’s hardly ever the case. Always counter the offer. Even if they refuse to budge on salary, there are other things you can ask for, like more comp time, flex time, benefits, and higher retirement contributions. Practice your negotiation skills ahead of time so that you can refine them prior to the real deal. Whether calling on a mentor or a trusted advisor, or heck, even practicing in your own bathroom, it’s important to take the time to work out the conversation and come up with possible scenarios so that you are adequately prepared. Negotiating your salary is something no one can afford to not do, but it’s even more important for women to take the stand in an effort to close the gender pay gap. Have you ever been afraid to negotiate your salary or benefits? Has it ever backfired, or have you been successful? I had a hard time convincing my GF to negotiate her first job offer. She felt like she was lucky to receive it. She finally tepidly requested a little extra money, and was shocked when they more than met her request. She felt like she was being mean when its all a professional game.